New York, NY—September 17, 2018—Scientists have long sought ways to convert abundant CO2 to useful products such as chemicals and fuel. As early as in 1869, they were able to electrocatalytically convert CO2 to formic acid. Over the past two decades, the rise of CO2 in the Earth's atmosphere has significantly accelerated research in CO2 conversion using renewable energy resources, including solar, wind, and tidal. Because these resources are intermittent—the sun doesn't shine every day, nor does the wind constantly blow—how to store renewable energy safely and cost-effectively is a major challenge. Recent research in electrocatalytic CO2 conversion points the way to using CO2 as a feedstock and renewable electricity as an energy supply for the synthesis of different types of fuel and value-added chemicals such as ethylene, ethanol, and propane. But scientists still do not understand even the first step of these reactions—CO2 activation, or the transformation of the linear CO2 molecule at the catalyst surface upon accepting the first electron. Knowing the exact structure of the activated CO2 is essential because its structure dictates both the end product of the reaction and its energy cost. This reaction can start from many initial steps and go through many pathways, giving typically a mixture of products. If scientists figure out how the process works, they will be better able to selectively promote or inhibit certain pathways, which will lead to the development of a commercially viable catalyst for this technology. Columbia Engineering researchers announced today that they solved the first piece of the puzzle—they have proved that CO2 electroreduction begins with one common intermediate, not two as was commonly thought. 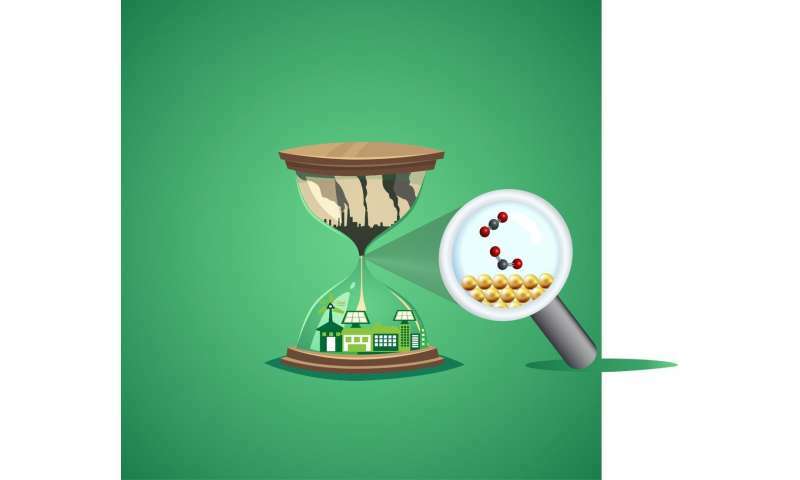 They applied a comprehensive suite of experimental and theoretical methods to identify the structure of the first intermediate of CO2 electroreduction: carboxylate CO2—that is attached to the surface with C and O atoms. Their breakthrough, published online today in PNAS, came by applying surface enhanced Raman scattering (SERS) instead of the more frequently used surface enhanced infrared spectroscopy (SEIRAS). The spectroscopic results were corroborated by quantum chemical modeling. "Our findings about CO2 activation will open the door to an incredibly broad range of possibilities: if we can fully understand CO2 electroreduction, we'll be able to reduce our dependence on fossil fuels, contributing to the mitigation of climate change," says the paper's lead author Irina Chernyshova, associate research scientist, department of earth and environmental engineering. "In addition, our insight into CO2 activation at the solid-water interface will enable researchers to better model the prebiotic scenarios from CO2 to complex organic molecules that may have led to the origin of life on our planet." Understanding the nature of the first reaction intermediate is a critical step toward commercialization of the electrocatalytic CO2 conversion to useful chemicals. It creates a solid foundation for moving away from the trial-and-error paradigm to rational catalyst design. "With this knowledge and computational power," says the paper's co-author Sathish Ponnurangam, a former graduate student and postdoc in Somasundaran's lab who is now an assistant professor of chemical and petroleum engineering at the University of Calgary, Canada, "researchers will be able to predict more accurately the reaction on different catalysts and specify the most promising ones, which can further be synthesized and tested." "The Columbia Engineering experiments provide such detail that we should be able to obtain very definitive validation of the computational models," says William Goddard, Charles and Mary Ferkel Professor of Chemistry, Materials Science, and Applied Physics at CalTech, who was not involved with the study. "I expect that together with our theory, the Columbia Engineering experiments will provide precise mechanisms to be established and that examining how the mechanisms change for different alloys, surface structures, electrolytes, additives, should enable optimization of the electrocatalysts for water spitting (solar fuels), CO2 reduction to fuels and organic feedstocks, N2 reduction to NH3 to obtain much less expensive fertilizers, all the key problems facing society to obtain the energy and food to accommodate our exploding population." Electrocatalysis and photocatalysis (the so-called artificial photosynthesis) are among the most promising ways to achieve effective storage for renewable energy. CO2 electroreduction has been capturing the imagination of researchers for more than 150 years because of its similarity to photosynthesis. Just as a plant converts sunlight into chemical energy, a catalyst converts electrons supplied by renewable energy into chemical energy that is stored in reduced products of CO2. In addition to its application for renewable energy, electrocatalysis technology may also enable manned Mars missions and colonies by providing fuel for the return trip and carbonaceous chemicals from the CO2 that makes up 95 percent of that planet's atmosphere. "We expect our findings and methodology will spur work on how to make go faster and at a lower energy cost not only electrocatalytic but also photocatalytic CO2 reduction," says Ponisseril Somasundaran, LaVon Duddleson Krumb Professor of Mineral Engineering, Department of Earth and Environmental Engineering. "In the latter case, a catalyst reduces CO2 using direct sun light. Even though these two approaches are experimentally different they are microscopically similar—both start with activation of CO2 upon electron transfer from a catalyst surface. At this point, I believe that both these approaches will dominate the future." The team is now working to uncover the subsequent reaction steps—to see how CO2 is further transformed—and to develop superior catalysts based on earth-abundant elements such as Cu (copper) and Sn (tin). The study is titled "On the origin of the elusive first intermediate of CO2 electroreduction." An interesting side note is that while at most 1-2% of the photosynthetic energy used by plants can be captured by extracting sugars, etc. most plants are much more efficient at converting CO2 into carbon compounds for its own use. Something on the order of 10-12% of the total sunlight plants get are converted. Using plants as a source of carbon atoms, rather than trying to extract fuel from them is thus an order of magnitude more efficient, and is inherently carbon neutral in terms of greenhouse gas emissions. Then by using recyclable energy sources to generate steam it is easy to convert the carbon into fuels using well known processes. I am not trying to downplay the significance of this research at all. Just a FYI.